First prominent woman badminton player in India. Ranked as world number one badminton player. One of the most celebrated sports personality of India. Saina Nehwal, is a badminton legend and was born on 17th March, 1990 in district Hisar of Haryana state. Saina Nehwal got her sports genes from her parents. Dr Harvir Singh and mother Usha Rani, who were former state badminton champions. She is undoubtedly the best female player currently in India. Saina was initially coached by Nani Prasad. Subsequently she was coached by SM Arif, an award winning badminton coach. When her family relocated to Hyderabad. The Pullela Gopichand Badminton Academy became her training ground where she developed her game and polished her skills. After five years of hard training, she made her debut in the first international in Indian Satellite tournament in 2003, where she was in top 16. In the same year, she won Junior Czech Open tournament. She stood second in 2004 Commonwealth Youth Games. Her unstoppable zeal to ace made her winner in the Asian Satellite Badminton tournament twice, once in 2005 and then again in 2006. In 2006, Saina became the first Indian woman to win a super series tournament, the Phillipines Open. After that, she bagged several wins in super series. She won the World Junior Championship, the Chinese Taipei Open Grand Prix Gold, the Indian National Badminton Championship and the Commonwealth Youth Games in 2008. Keeping a record of all her wins, she was declared the most promising player in the same year i.e. 2008. In 2009, she became the first Indian to win a Badminton World Federation (BWF) Super Series Title, the most prominent badminton series of the world by winning the Indonesia Open. She also reached the quarter finals of the world championship. Her career was stamped with a milestone when she was honoured with the Arjuna Award in 2009. Saina won the sports category of CNN-IBN Indian of the Year 2009. Apart from this, many other awards and accolades fell in her court in 2010 like Padma Shri Award and Rajiv Gandhi Khel Ratna Award. Saina marked a glorious moment in Indian sports history when she won a gold medal as one of the eight brand ambassador of 2010 Commonwealth Games. Since, the beginning, Saina has given her best to her profession and passion. Her success graph is evident of a determined and disciplined sportsperson. From 2010 to 2011, Saina won many super-series, such as Singapore, Hong Kong, Indonesia Open Series and the Swiss Open as well. When Saina became the first Indian woman to win a medal for Badminton at the London Olympics in 2008 it was the memorable year for Saina as well as India. Saina was ranked as world's number one player in 2015 when she won her maiden women's single title at the India Open Badminton World Federation (BWF) super-series beating Ratchanok Intanon of Thailand. She won the Big Star Most Entertaining Sportsperson Award of the year of 2015. Saina is the only one after Prakash Padukone to win a Danish Open Super series title. 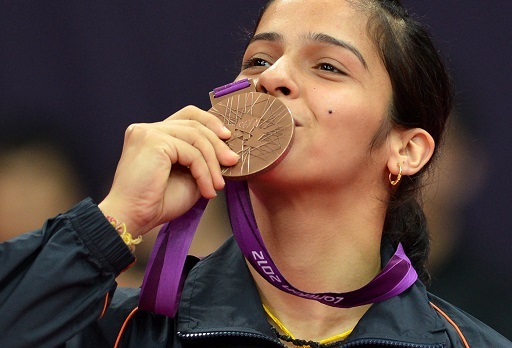 Saina was supported and rewarded financially by the Haryana Government, the Rajasthan Government, the Andhra Pradesh Government and the Badminton Association of India for winning a medal in the Olympics. She is also supported by the 'Olympic Gold Quest' which is a programme of the foundation of sports and games. It identifies and supports. Indian athletes with a proven track record and who have a potential to win Olympic Gold Medals. She is also the brand ambassador of Sahara India Pariwar. Saina's appetite for success is great and she always tries to conquer higher endeavours. The shuttlers' impressive run in the sport has not only earned her wealth and fame but also respect of sportsperson from various disciplines. She is the highest paid (non-cricket) sportsperson in the country. Her achievements and growth in stature has made her one of the most celebrated sports personality of India. Despite surpassing the achievements of all the sports women in the country, she remains down to Earth and leads a very disciplined life.